Let's start a fashion riot. : VOGUE. Im pretty sure everyone has heard of the London Fashion Week that was held from 18-23 Feb, just 2 weeks ago. Ive gone thru all the trend reports , catwalk videos AND I'VE PICKED OUT SOME OF MY FAVS! Designers that i absolutely love are David Koma , John Rocha and Eun Jeong. Check them out! The 3rd outfit reminds me of Black Swan. The pointy edges resembled the feathers. HAHA. John Rocha's A/W collection are sooo edgy! Loving the monster outerwear and the mesh seethrough pants. AND ISNT THE last outfit soooo adorable? 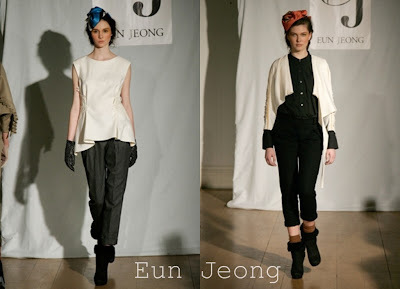 I picked out these 2 from Eun Jeong's A/W 2011 cos they are simple and CHIC. Enough said. PPQ's outfits are definitely inspired by lady gaga. Im pretty sure it is. LOOK AT THAT HEADGEAR!